Proprietary Name: Gas-x Maximum Strength Softgels What is the Proprietary Name? Gas-x Maximum Strength Softgels with NDC 0067-6283 is a a human over the counter drug product labeled by Glaxosmithkline Consumer Healthcare Holdings (us) Llc. 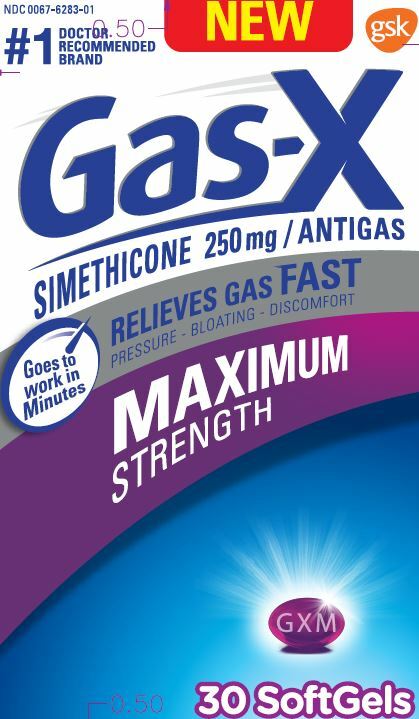 The generic name of Gas-x Maximum Strength Softgels is simethicone. The product's dosage form is capsule, liquid filled and is administered via oral form.